In the previous video, I've shown various options to connect an ESP8266 module to an Arduino board. Now it is time to turn that into something (sortof) userful. Watch this video to see how I build a web connected thermometer. The program is a bit particular in that it wants AT-firmware 0.9.2.2 to run stable. I have tried the latest AT firmware but had no luck and didn't invenstigate any further. It's default baud rate of 9k6 is slow enough for a SoftwareSerial connection. * The IP address is displayed to serial upon successful connection. To keep the Arduino's original debugging facility, I kept the hardware UART for that purpose and defined a "software serial" port on pins 10 and 11. The suggested firmware version defaults to 9600 baud, so speed is not an issue. I follow your blog and it is very inspiring! I would like to ask you how I can I publish this data to mqtt? I have several arduino that works perfectly stable with sensors and now log the readings flawlessly to SD cards, but I want to add esp8266 to send the sensor data every 30 seconds with mqtt to a mosquitto server running on raspberry pi. I'd first check if the Arduinos are still necessary. The NodeMCU firmware has a fairly robust MQTT implementation. ( http://www.nodemcu.com/docs/mqtt-module/ ). So you might interface the sensors directly to the ESP module. I've tried with using only esp and sensor, but several different tests have proven that the esp was so unstable and would not provide consistent results and more than often freeze. I also tried the espduino. No problem flashing it to the esp but then when uploading the ino file to the arduino only gives weird characters and could not make it connect. 1) You're only programming the Arduino from the Arduino IDE, so you have to choose "Arduino Uno" as the board. 2) Do you have the 0.9.2.2 AT-firmware on the ESP8266 module? Oh, I see. Try a "#define BUFFER_SIZE 100" at the top of the sketch. Haven't tried that yet, though. I want to share my project with you, i want to connect 3,4 sensors with arduino and esp8266 so that I can get the data of them all on my mobile. Sir please i really need your help in this project.please reply me some valuable tips. If your sensors are I2C devices, this should work great for you. Sir I think you have made this project on CWMODE=1 but I want to make it on CWMODE=2 ie TCP/IP client mode. Moreover I want to do this on arduino itself. Have you made any project related to this in which we don't use any external Wi-Fi like I think you are using in this web thermometer. 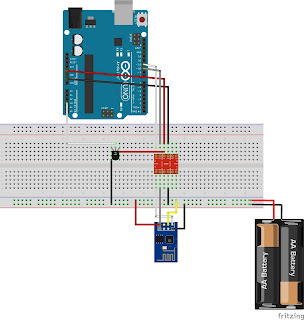 Can you guide a little bit for "How to transmit sensor data using arduino and esp8266 on tcp/ip mode. Sir Thank You for the awesome tutorial.I appreciate your hardwork nad dedication. Sir how can we figure out if AT-Firmware is there or not on ESP-8266? You can see that from the response on the serial interface. The easiest way is to use "esplorer". It has pre-defined commands for both NodeMCU and AT-Firmware. Please check if that is near the beginning of your code. Arduino: 1.6.10 (Windows 7), Board: "Arduino Nano, ATmega328"
The sketch should be ok on a Nano. But if you don't want to use SoftwareSerial, this breaks all lines with "esp." I'm already way ahead of you ;) As soon as I encountered problems, I went to the original. Unfortunately I have issues there too but my post at rayshobby.net remains unanswered. I give up. Thanks for the help though. No need to give up. The downside of Ray's original sketch is that you can't use the standard port for debugging on an arduino. Do you need all the GPIO pins and can't spare the two pins for the software-uart? I am using an ESP8266 on an adapter board with a Nano because I don't want to have to deal with level shifting. The adapter does all this for me so I have only 4 pins coming from my ESP. GND VCC RX and TX. The module works just fine, can connect to my wifi and be pinged on the network. - No issues there. GPIO pins are not really the issue, the issue is that I don't have a serial programmer (yet, on order) so cannot use the software serial. Of course I realize it doesn't need to be removed from the code. So I think it's pretty clear I'm out of my depth with this project as a complete beginner with arduino and ESP. I just don't have the skills or knowledge to make this work. Arduino: 1.6.11 (Mac OS X), Board: "Arduino/Genuino Uno"
It's great tutorial to start Arudion-ESP-01 Connection! Thank you. I have a question about the "Logic Level Shifter". On above image of diagram which connection between Arduino and ESP-01. On the side of ESP-01 with "Logic Level Shifter", they have no any connect! Is it possible? on the Arduino "HV","GND" connected, but "LV" is not connected(Even "GND" on ESP-01 connected"). Ooops! You are right! Funny no one noticed that yet: The connection from the battery (3V) to the LV (=Low Voltage) supply of the level shifter is missing.